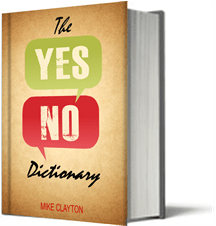 The Yes/No Book is filled with new and specific concepts in personal effectiveness and time management.ï¿½ To make a valuable resource for readers, and to introduce non-readers to some of the core concepts of the book, I am preparing a dictionary. It will be in 13 parts (Superstitious? Iï¿½m not) and will have around 50 entries. A balanced and happy life is one where you are able to get the right mixture of goal- and desire-directed activities. Hedonic Happiness (abs noun); the pleasure and joy of the moment.ï¿½ See also Desire-directed activities. Eudaimonic Happiness (abs noun); the happiness, contentment and well-being we feel, when we are happy with our lives. Flowï¿½state (abs noun); the state we enter when we do something we are good at, to the limit of our skills and experience, and we have a clear goal in mind and the ability to track our progress. Here we lose all track of time and have a deep sense of satisfaction from what we are doing. The term was coined by psychologist Mihaly Csikszentmihalyi and is the subject of his book, ï¿½Flowï¿½. download resources and buy a copy at The Yes/No Book website.